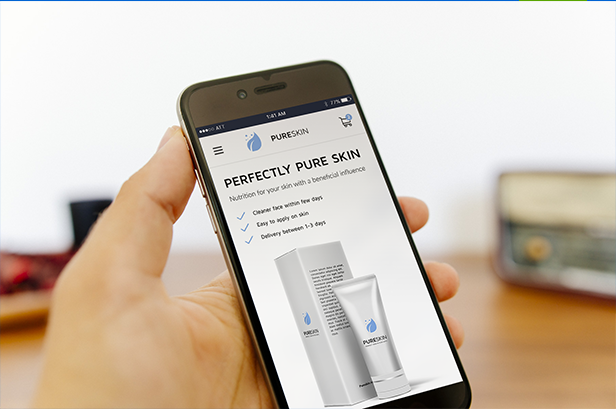 PureSkin – Single Product / One page PSD Package consistes of 2 PSD files with Modern, Clean Design, Ecommerce ready, and well organized layers. The theme aims to have High Conversion rate UI design for single products. UI Design PSD file is built for Bootstrap 4 with 1170 px grid. It has been develop by years of Experience with selling and marketing, Dropshipping products from alibaba.com, aliexpress.com, amazon.com and many more. I have done high sales with white label products by having great Call to Action Buttons in well placed positions. Remember Mobile-first, Most sales today is done with the Phone. Looking for Shopify or WordPress Theme version of PureSkin? Leave a comment with which CMS Platform you are looking for and we will develop it by votes.